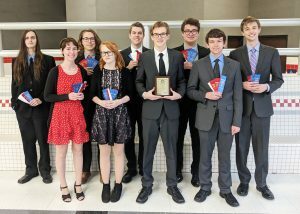 MHS Decathlon Receives 60 Awards At District Competition! On Saturday, January 19th, the Martinsville High School Academic Decathlon team competed in the USAD District Competition at Madison High School. The team received 24 First Place Awards, 24 Second Place Awards and 12 Third Place Awards; earning a total of 41,841.1 points. Devon Heath: 1st in Language and Literature, Economics, and Social Science. 2nd in Speech, Art and Science. 3rd in Math and Music. Joe Rahman: 1st in Art, 2nd in Economics, Language and Literature, and Math. 3rd in Science. Mason Littell: As the alternate, Mason competed but was not eligible for medals. Mason was selected by his team to give his speech in front of all the teams as a part of the Speech Showcase. Baileigh Hofer: First in Science, Art, Math, Economics. 2nd in Essay, Social Science, and Music. 3rd in Speech. Sabrina Chouinard: 1st in Music, Social Science, Essay. 2nd in Economics, Art and Science. 3rd in Language and Literature. Brandon Duke: 1st in Language and Literature, 2nd in Music and Math, 3rd in Essay, Economics, Science. Gus Eaton: 1st in Interview, Economics, Math, Language and Literature, Music and Science. 2nd in Art, essay, Speech and Social Science. Cameron Clark: 1st in Essay, Speech, Science, Art and Social Science. 2nd in Language and Literature, Music, Mathematics, Interview, and Economics. “The team is pumped to keep working hard and compete at the state competition at Purdue University on February 8-9. If successful, the team will win their 20th Academic Decathlon State Championship”, said Chris Sturgeon, Academic Decathlon coach and MHS teacher. The US Academic Decathlon (USAD) is a 10-event scholastic competition for teams of high school students. Each high school enters a team of nine students: 3 Honor students (3.750 – 4.00 GPA), 3 Scholastic students (3.00 – 3.749 GPA), and 3 Varsity students (0.00 – 2.999 GPA) – usad.org.